Determine how you hire: hiring the person who will best fit into your team is probably more important than technical expertise. Your company values help determine best fit – if ‘passion’ is a company value, for example, you can assess whether a new potential recruit possesses this quality before making any offers. Change behaviour: any corrective feedback given to employees is more effective if connected to how their behaviour is not reflecting company values. Set the heart of your culture: values are the fabric of the company’s culture, regardless of who currently runs the organisation. Like-minded people who share the same values are the best path to company success. CoGrammar, integrates scaled and affordable human review of code into businesses around the world, and prides itself on embodying a unique company culture to close the global tech skills gap. The company currently helps some of the world’s most selective and rigorous coding education providers lower the cost of technical grading and mentorship in their tech courses. CoGrammar has powered coding education for over 2000 students to date to lower the cost of effective software development education that gets aspiring developers into fulfilling tech careers. What are the start-up company values of CoGrammar? Here are the four P’s, which have propelled the company into becoming one of the top EdTech startups in Europe, the Middle East and Africa. This is at the heart of CoGrammar. Because our goal is to change lives, we put purpose first and build our integrity on that. 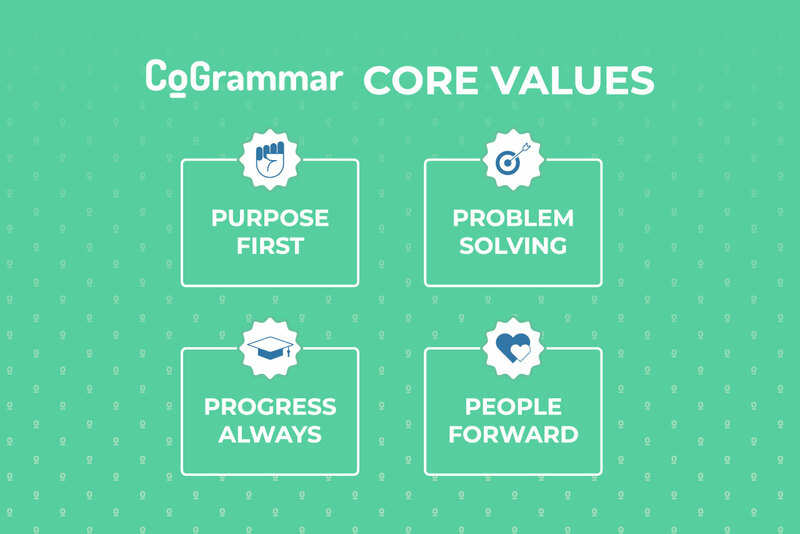 What we do at CoGrammar is greater than each individual. In essence, we are building new roads to bring technology skills into the world. We always progress towards mastery. The company is built around knowledge sharing with each other and our mentors. The company culture is one of learning, collaborating, improving and setting new standards. At CoGrammar, we write code right. We respect people and their potential. By people, we include our teams, our clients and our educators. When it comes to education, people are at the heart of what we do. We remain sensitive to their needs, hopes and desires. We prioritise the value in every person above technology, and we talk as much as we listen. This value is about finding a way to do things, and not about “how it can’t be done”. It’s about not giving in or giving up, but about being entrepreneurial and innovative under pressure. We work towards solutions while maximising resources. In conclusion, the start-up company values, or 4 Ps, help CoGrammar reach its objectives of supporting students from over 40 countries to reach their goals of acquiring fulfilling tech careers. States CoGrammar CEO Riaz Moola: “Bearing in mind that tech disproportionately contributes to a country’s economy, we have to look at ways of reducing barriers to entry. One way to do this is to embrace non-traditional education paths.” The company values of CoGrammar make massive strides in achieving just that.